You just need Pillsbury® Gluten Free refrigerated chocolate chip cookie dough and 2 more ingredients to make these fun and delicious gluten-free treats! 1 Heat oven to 350°F. In medium bowl, break up cookie dough. Knead in chocolate until well blended. Shape rounded tablespoonfuls of dough into balls. On ungreased cookie sheet, place balls 2 inches apart. With bottom of glass, flatten slightly. 2 Bake 10 to 12 minutes or until set. Cool 2 minutes on cookie sheet. Remove from cookie sheet to cooling rack. Cool completely, about 30 minutes. 3 For each sandwich cookie, spread 1 tablespoon frosting on bottom of 1 cookie. Top with second cookie, bottom sides together; press together gently. 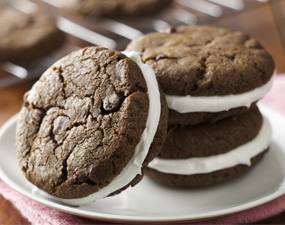 We like the white filling in these sandwich cookies, but if your family loves chocolate, why not substitute chocolate frosting for the white?